﻿ SELL MY JUNK CAR FOR THE MOST CASH ON STATEN ISLAND! FREE PICKUPS! 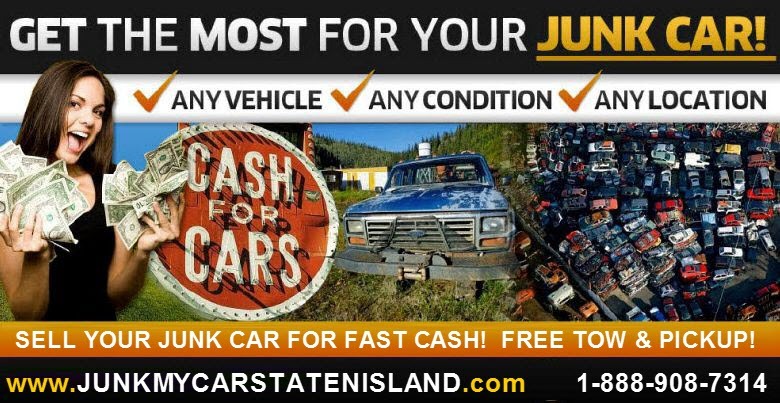 Junk My Car Staten Island is Staten Island's #1 Junk Cash for Cars service. Although most of our buys are newer cars, we have aggressive buyers that will offer you cash for clunkers. We treat people with the utmost integrity and respect. Our Junk Buyers make fair offers and will not insult you. They give realistic quotes and giving you the cash you need for your junk car. We get you fast offers and pick up that old, junk or severely damaged car hassle. Fast Cash! Let our knowledge of the market and experience as a dealer get you more money for your junk vehicle. We specialize in appraising in all types of vehicles and we'd love to give you cash for your car. Why try finding someone to pick up that car when we can do it for you. Just a little phone call will start the ball rolling. We'll make sure you get a price prior to showing. We make the "selling my junk car" process as easy as possible. You won't have to spend another penny advertising your vehicle for sale and dealing with strangers calling you at all hours of the day.